Goodreads Summary: There are people in this world who are Nobody. No one sees them. No one notices them. They live their lives under the radar, forgotten as soon as you turn away. Who can resist a good assassin story? When I first read the summary for Nobody, it struck me as a unique, inventive story, and it didn't disappoint. I was intrigued by Nix and his world from the very beginning and quickly drawn into the story, eager to learn more about him the world that Jennifer Lynn Barnes created. Less than shadow, less than air - that's what Nix has been taught to be. He is Nobody, he is invisible, and he always kills his targets. Until Claire. Even though he has his assignment to eliminate her, has his gun trained on her, he can't bring himself to pull the trigger, because Claire can see him, and she might be the only one who can. Instead of killing her, Nix goes so far as to help protect Claire from The Institute. Together they learn the full extent of what Nobodies can do, especially when they are together. But Nix knows better than to think that The Institute will simply forgive his failure to follow their orders. As he tries to figure out what to do, he and Claire come to learn shocking truths about The Institute, leaving them with only one choice - to expose The Institute and hope that they make it through the ordeal alive. In Nobody, Jennifer Lynn Barnes has created an interesting world in which basic human interactions are guided by energy; those who can't transfer energy are denied those interactions. I really enjoyed seeing how this premise translated into people being divided into Nobodies, Nulls, Sensors, and Normals. As Nobodies, Nix and Claire don't have the ability to transfer energy, and so they have lived their lives unseen, unimportant. Whereas Nix became an assassin for The Institute, Claire spent her days trying to be good enough. I couldn't help but feel sorry for her at the beginning, but over the course of the book, Claire learned to embrace the abilities that being a Nobody brought her. The third-person point of view that alternated points of focus allowed for seeing both Claire and Nix's emotional journeys, which were interesting to watch, as they were opposites in many ways. I also enjoyed watching their time together, especially in the fade. Nix slowly transformed from someone who had been taught to subjugate emotions - which admittedly made him slightly flat at first - to someone who tried to express them, and that allowed for some very sweet moments between him and Claire. Even though this book was 400 pages, it never felt long. Jennifer Lynn Barnes' writing style was concise and direct while still spinning a gripping story. Even though this was the first book of hers that I read, it made me want to read her others, as there was never a dull moment here. There are so many possibilities with the world she created, and I can't help but wonder if there will be a companion novel to this one. With enough science fiction elements for intrigue, dystopian elements for suspense, and romance for a swoon-worthy moment or two, Nobody makes for a quick, fun read. I will look forward to reading more books by Jennifer Lynn Barnes! 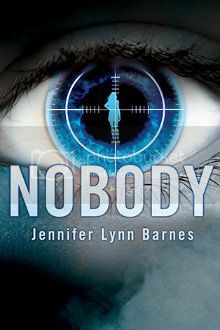 I am very excited to have one hardcover copy of Nobody and one paperback copy of Jennifer Lynn Barnes' previous book, Every Other Day, to give away! Please note that the book will be coming directly from the publisher; please allow ample time for the book to arrive if you win. This contest will close on Friday, Feb. 15 at 12:01 AM. Glad you enjoyed. For whatever reason, I couldn't get into this one.